Linkbacks: Gregori and Hamud staring. Dr. Bunny-Me. 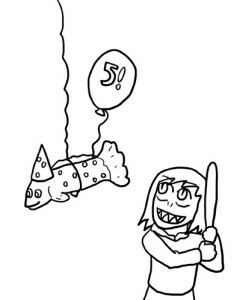 Also, yesterday was the comic’s 5th birthday! Selkie (the story) is now FIVE! Pure curiosity: is Selkie a Christian? Selkie’s been raised a-religious so far. The orphanage is government run and doesn’t teach religion (plus there’s concerns that giving the kids one religious viewpoint might cause problems with potential adoptive parents). That, of course, raises the question of whether or not the Sarnothi have native religion(s). It could be. I wasn’t sure if it was a religious myth or just a general historic myth. I might add that given the up to recent cultural isolation of the sarnothi people, they would probably not been exposed to human religious influences whether they perceive a common deity or not. Sarnothi have their own religion centered around oceanlife, I imagine – That “mythological” story about the maiden and the eel god might not be so much “myth” as their version of a religious story. Sarnothi (those raised in the culture, anyway) observe a pantheon of greater and lesser spirits. Han Shin Jian Tho is the most powerful of them (like Zeus or Odin in their respective pantheons), and viewed with both awe and fear as he’s also a grim-reaper figure. He taketh and he giveth away, etc. Hey’ Dave, how about a link to the bunny ear appearance? Am I the only one that thinks Pohl’s design is adorable? HE’S ADORABLE XD ALSO, currently I am working on some giftart for you, Dave…. art that doesn’t need to be censored and even has something to do with the current storyline!! gasp! I wonder how they’d react if they came across somebody who thought they were in costume and started gushing over how realistic the “costumes” looked. Congratulations, Selkie, on your fifth birthday. May you have many more. 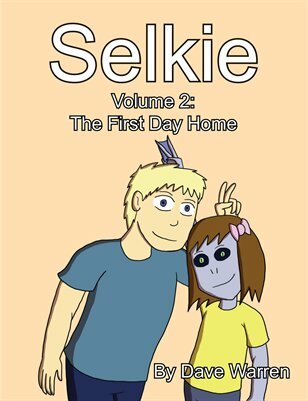 Didn’t notice till this morning that “Selkie Volume Two” is available…I’ve already ordered a print copy. Another congratulations due. Huh, I just realized, what about selkies in-comic birthday? I would sopose that with modern record keeping the parent would be able to just request to know the birthday listed on their adopted childs birth certificate, but selkie wouldn’t have a birth certificate would she? Without any other way to know what her birthday was, the orphanage staff wrote down the day she was dropped off as her official birthday. Selkie-the-character’s birthday is the same date as Selkie-the-comic’s: May 24th. Happy 5th Birthday to Selkie and a big hug for creating such a special comic that I enjoy reading every day. Here’s one for you, Dave. Pisces is late February/early March – COLD. Would this species be able to have children born in that time of year? Are they, like warm-blooded humans, able to have kids year-round, or are they more like fish and reptiles – stuck to certain times of the year? And yes, I am aware that many other “warm-blooded creatures” are also stuck to certain times of the year. But they – cats, dogs, horses, etc – are not sentient beings. Todd SERIOUSLY had to ask that? It’s one thing to be accepting of others and their appearances, and Todd’s multiracial family is a good reason for him to be that way, but he HAS to have noticed how people respond to Selkie by now. Sionyx> I agree, and then I look at them and the De’Madeas are green shades versus Selkie’s less, um, upsetting periwinkle shade. And given the eye stripes and other natural decoration of adult Sarnothi, I think they look far more intimidating as a species in adult form. Eh. Who knows. Maybe Todd really is that ignorant. I dunno whether he’s just totally accepted the fact that his daughter is a previously unknown species of sentient aquatics on Earth or whether it is just sinking in how big a project this is and how integral her role is. I mean, do the De’Medeas go out often? Do they try to participate like any other? Like, if Todd asked, would they go dine with Barb and Ken (I think those were Heather’s adoptive parents’ names…) I find it funny and fascinating that each one at their respective dinner parties tried to cater to Todd’s veggie-ness. I think he had the webbing surgically removed to make it easier to wear disposable gloves. Yep, the lack of webs is intentional. Sadly I know how she feels, to a point of course, but I get stared at a lot because I have to wear a duster or trench coat whenever I go out due to sun allergies, people stare all the time and I’ve had parents yank their kids away from me to the point that if police had been available they would’ve gone to jail for child abuse due to the whiplash and one actual disjointed arm incident, but of course I was the bad guy. In all honesty if I had a chance to adopt someone special like Selkie or even could someone like her I would.